Short on Time? Try a Wipe & Wax. The in-between cleaning method to maintain the shine. Somewhere between a full-out drywash and a rinseless wetwash lies the cosmetic wipe down or Wipe & Wax. More specifically, the Wipe & Wax using CitriCut Xtra is a wipe-until-dry method of cleaning, engineered to use polish residual as both cleaner and gloss enhancer. 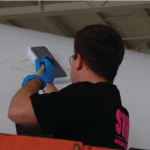 Apply CitriCut Xtra to aircraft skin with mop, pad or cloth. Dilution ratio of 1:4 is dependent on amount and type of soil to remove. Once the surface is wiped clean of the emulsified soap/soil, a degree of polish will remain on the surface as a component of any residue. To maximize ChemWipe cleaning use a soft or fluff wipe-until-dry process, rather than the aggressive scrub of a wetwash soap. The soft or fluff wipe-until-dry process will remove any remaining dried soap and soil slurry and at the same time, enhance the gloss factor. ChemWipe: The way to go in the in-between.